The project to create a section at Versailles devoted to the history of the château was, in principle, a good idea as it is difficult for visitors to understand how the domain was established over time. This project, initiated by the previous president, was finally inaugurated by Catherine Pégard. Eleven rooms have been reorganized, on the ground floor of the north wing, for a total amount of 1.5 million euros. Results, speaking kindly, are mixed. Although the selection of works is pertinent and the presentation clear, the choice of setting is very debatable especially since it follows a museum layout produced by Pierre Lemoine in the 1970’s which had aged particularly well. 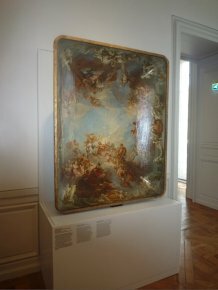 While some works have come out of storage, such as the ceiling project by François Lemoyne for the Salon d’Hercule (ill. 1), many more have been put away but we have been told they will be exhibited later in the "future Louis XVI rooms". 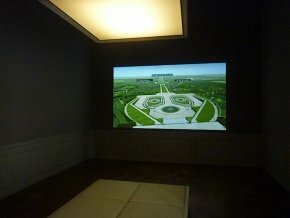 The château in any case seems very proud to introduce multimedia effects in its rooms, thanks to a partnership with Google which was in charge of producing 3D models for both the château and the gardens, as well as creating animations to present the evolution of the ensemble of the buildings. We in no way oppose this innovation which is in fact rather well done as anyone can see on internet. But was there really a need to use four whole rooms for this (ill. 2), out of a total of eleven , for these short films which each last just a few minutes, when they could have contained many other works ? Béatrix Saule’s explanation claiming that these films are indispensable for visitors’ understanding, since the collections are not rich enough, is not convincing. Even admitting this were true, one room would have sufficed for the four films. Should museums address themselves to those who refuse to look at works which speak for themselves ? And if so, what good are they, except to flatter the taste of persons who do not like them in an attempt to convince them that a video sequence is worth more than an 18th century painting ? The last film, a succession of images which evoke some of the landmark events at Versailles in the 20th century is in fact not that interesting. It shows several official visitors : Kennedy, Nixon...Strangely, Colonel Khadafi’s visit in 2007 is diplomatically forgotten. to the history of the château at Versailles. The wall motifs are not very visible on these photographs. 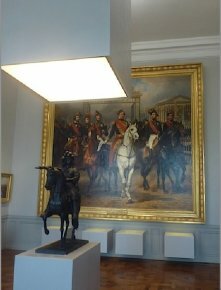 The large chandelier partly hides the painting by Horace Vernet. Fortunately, the decoration is done in light tones (ill. 3) and in fact barely visible (or at least in photographs) as the décor of the walls (on "Corian engraved with a specific motif for each room" is in blatantly poor taste. We are pleased to see that the Louis-Philippe wood panelling and cornices have been kept but they are not at all enhanced. The enormous "chandeliers" (ill. 4), big inelegant boxes (here again in "engraved Corian") invade the space unnecessarily. According to the press release, this is because the architectural project by the Projectiles agency, "was commended [we are not told by whom] for its contemporary dimension and its daring in wishing to write a new phase of the architectural history of the château." A modest claim. Pierre Legros and Benoît Massou. This is thus a far cry from the Musée de l’Oeuvre Jean-Jacques Aillagon talked about in his first press conference. 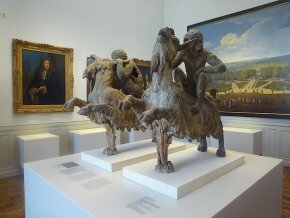 For instance, two lead sculptures from the Labyrinth are exhibited (ill. 5) but what about all the others ? A real Musée de l’Oeuvre should be much more ambitious in scope and present all of the vetiges from this fountain (this is just one example). In concluding, it is very surprising to see that the exact amount of the refurbishment and particularly the funding provided by the Etablissement public from its own pocket, remain undisclosed. 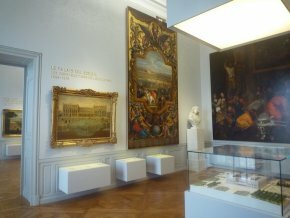 Indeed, Versailles does not wish to elaborate on the number of 1.5 million indicated in the press release for the renovations, thus intentionally keeping us in the dark concerning Google’s contribution for the 3D models and the refurbishment. Whatever the final expense was for Versailles, the numbers were much too high : the lighting could have been very simple instead of choosing these horrible chandeliers which we are told weigh over 500 kg. and the walls could have been painted without resorting to the "1000 m2 of Corian", a material which, if we are to believe Wikipedia, "is used essentially in manufacturing kitchen counters" ! Only the first one, offering the introduction, presents at least one mockup.